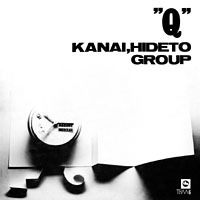 The sixth album released by Three Blind Mice turned the spotlight on Hideto Kanai a veteran bassist who had been pursuing a very progressive, unique and uncompromising kind of jazz since the early 1960s. With his passion for educating young musicians and adventurous nature, Kanai has drawn some comparisons to another great leader, Charles Mingus, whom he respected. The four performances in this album are all free-oriented and may be challenging for some listeners, but they riveting, fascinating, and ultimately satisfying. The opening and closing numbers were actually quite "composed." In an interesting collaboration with contemporary composers (from the world of classical music), Shuko Mizuno wrote "April" and Hiroshi Nanatsuya wrote "Meditation" specially for this group. Produced by Takeshi Fujii. Recorded at Aoi Studio, Tokyo, in May 1971 by Yoshihiko Kannnari. Blu-spec CD is compatible with all regular CD players. Paper sleeve special limited edition.